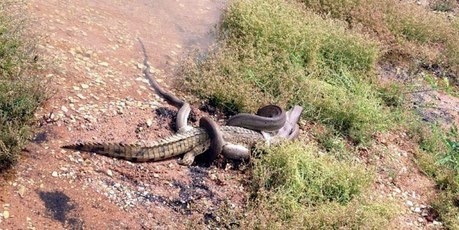 Travis Corlis managed to capture the epic battle between a python and a crocodile at Queensland's Lake Moondarra, near the mining town of Mount Isa, Australia. Admittedly the crocodile was only a baby being one metre in length but the struggle was impressive enough so much that Tiffany said, “We were sort of thinking that the snake had bitten off a little more than it could chew”. Ultimately the beast with no legs one and the crocodile was suffocated by the python’s death grip. 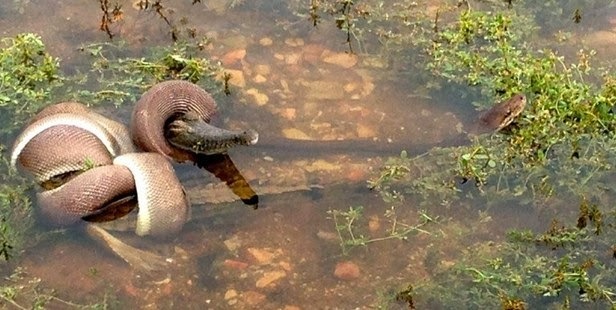 We've actually seen this kind of battle a few times before, notably this anaconda versus alligator from the Everglades. This Aussie python managed to drag a walleroo up a cliff and this one just wasn't that smart at all. One last one, it's not just Australian pythons you have to watch out for, this python from Bali ate a cat and then threw it up!